Announcement Welcome to Crater Goods, We make finely crafted wooden pet products for fur parents requiring quality handcrafted items such as dog kennels, dog beds, and dog gates for thier precious fur babies. We also produce handmade wooden home decor items to match our rustic pet products making a cohesive collection of fine decor giving you the abilty to seemlessly mesh each room together. We are always happy to customize any of our products to fit your needs. Feel free to convo us to discuss your needs. Welcome to Crater Goods, We make finely crafted wooden pet products for fur parents requiring quality handcrafted items such as dog kennels, dog beds, and dog gates for thier precious fur babies. This is absolutely beautiful!! The quality, design, color, and design is exactly how described. Even the way this was shipped - perfectly packaged to avoid any possible damaged. Super impressed. This is so gorgeous. My dog absolutely loves it!!!! Thank you...well worth the wait. Our shop helper (Tyr) laying down on the job. Working on a kennel base, reinforcing base for larger breeds. Our story begins with the purchase of our first Rottweiler together (2016), Tyr. A beautiful young male Rottweiler pup, whom is full of energy and life. Life was not easy for our young pup, contracting and losing his brother to the parvo virus. Tyr was able to make a full recovery from his illness, and move forward with us to our next chapter of life. This brings us to January 2017. With the decision to devote our life to the betterment of our chosen breed, we established Schaferhaus Rottweilers. With this decision we added two females to our growing family. Ice and Val, to amazing and gorgeous Rottweiler pups. 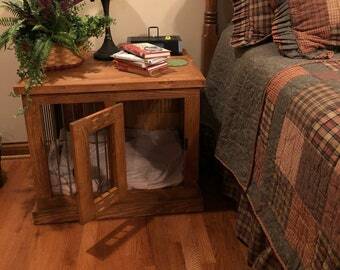 Each pup needs their own space to provide security, but we did not like the wire kennels. 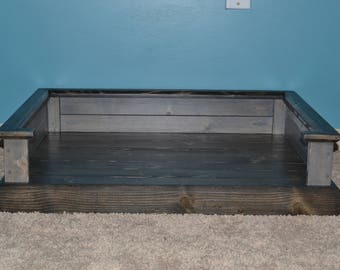 We found many businesses that made wooden kennels, but were limited on color choices, and the did not sell other home decor items that matched these kennels. 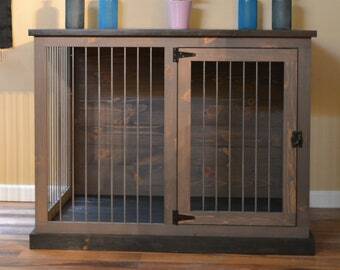 We have set out to create a place for customers to purchase quality wooden kennels, and matching home decor. We want our kennels to blend seamlessly into our customers homes and want to provide quality products to make that a viable option. I have been the creative type for many years. This creative personality has taken me down many paths as a graphic designer, construction worker, and machinist. Over the last several years I have come full circle and found myself back in wood working. My creative counterpart and partner in life. Her backround in manufacturing make her a great addition to our business. She handles the technical paintwork and detailing. Assits with modeling our products, and tests finished products for worthiness for your home.